Valentine's Day is a week away! 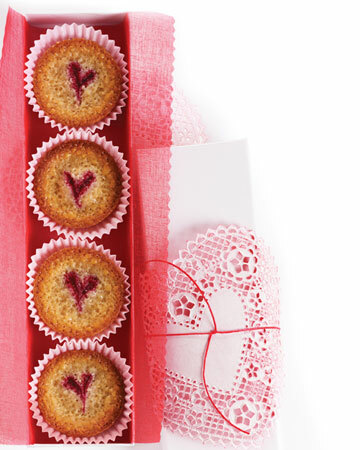 What better way to show some love than through food :) Found this recipe from Martha Stewart for these appetizing raspberry almond financiers. Yummy and pretty. The following recipe yields 45. Spoon batter into muffin cups, filling each halfway. Spoon a scant 1/2 teaspoon raspberry puree near one edge of each cup. Draw a skewer or the tip of a paring knife through puree toward opposite edge of cup to form a heart shape. What's your favorite Valentine's Day treat? Yumm! Going to try this! You made these? They look amazing! Mmmm...I don't bake but I have a sister who does! I'm not sure why but here in Texas the Valentine treat is chocolate covered strawberries, which I just made for the first time...so easy! These are soo cute for valentines day! I have no treat but I would like to treat myself to a flour less chocolate cake... YUM! This is perfect for the month:)a valentines gift to our love ones and a flour less chocolate:) thank you for sharing! What a perfect Valentine's treat! SO cute and seasonal -- I love! Mm those look so delish! Yummy! They look so good I'll have to try this recipe out!